Receipts 1.8.3 – Smart document collection. 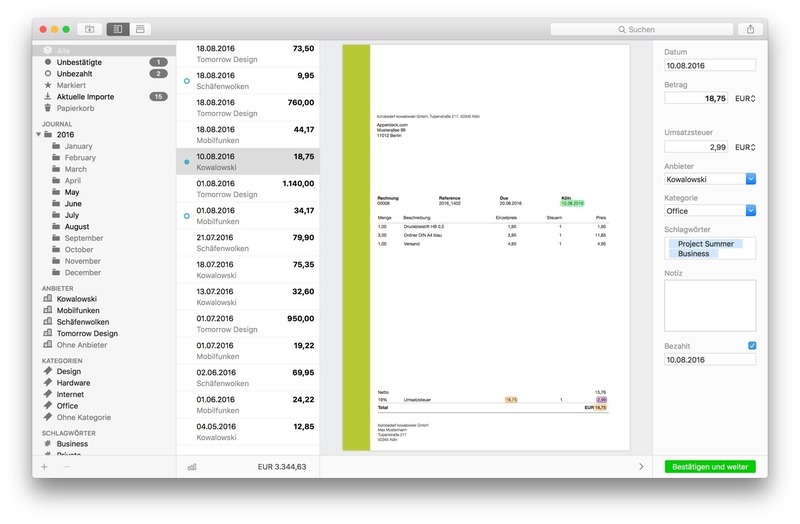 Receipts enhances your incoming invoice management. Recognize: Receipts recognizes gross invoice amount, slip date, declared sales tax, currency, and bank account details automatically and, thus enables the busy user to speed up his incoming receipts management. Classify: Receipts’ smart character recognition identifies once recorded providers automatically, and thus is able to capture recurring documents correctly and assign to the right category. Next story MetaImage 1.3.2 – Edit images’ metadata. Previous story Habitify 4.3 – Daily Routine & Goal Tracking. Moneydance 2017.10 – Personal finance manager. QuickBooks 2016 17.2.22 – Financial management and accounting for small businesses. Banktivity 5.6.6 – Intuitive personal finance manager; widget available (was iBank).